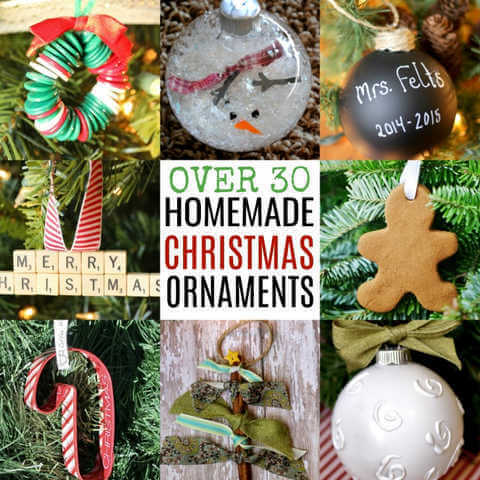 If you are looking for some clever (and easy) ornaments that you can make on your own, we’ve rounded up over 30 Easy Homemade Christmas Ornaments. These easy homemade Christmas ornament ideas are also fun to make with the family for a fun family craft night. 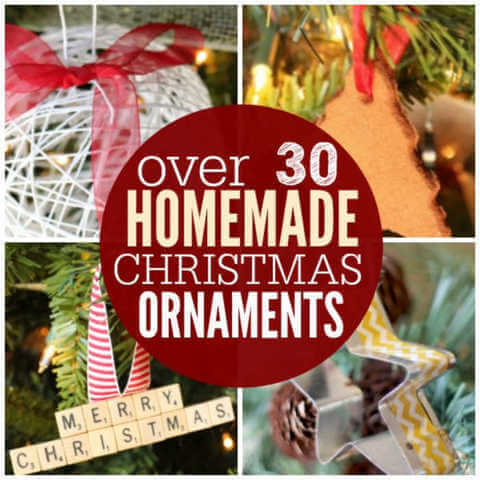 Whether you are wanting to add more decorations to your own tree or make some unique gift toppers, you will find your favorite homemade Christmas ornaments here. Plus, Homemade Christmas Ornaments make great gifts! With so many unique ideas, you will have tons of ideas to get you started. We even have Homemade Christmas ornaments with things around the house! Not only are these pretty but they are frugal. You don’t need to break the bank or spend a ton of time to have gorgeous ornaments that everyone will cherish. 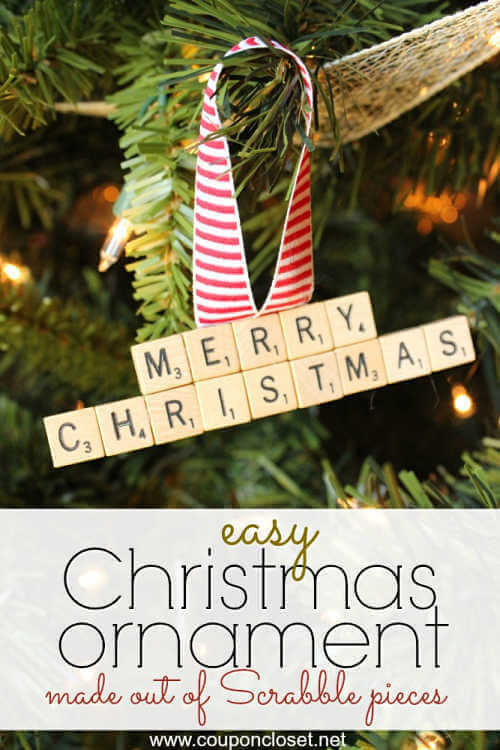 No need to look for DIY Christmas ornaments Pinterest ideas with so many great ideas right here! 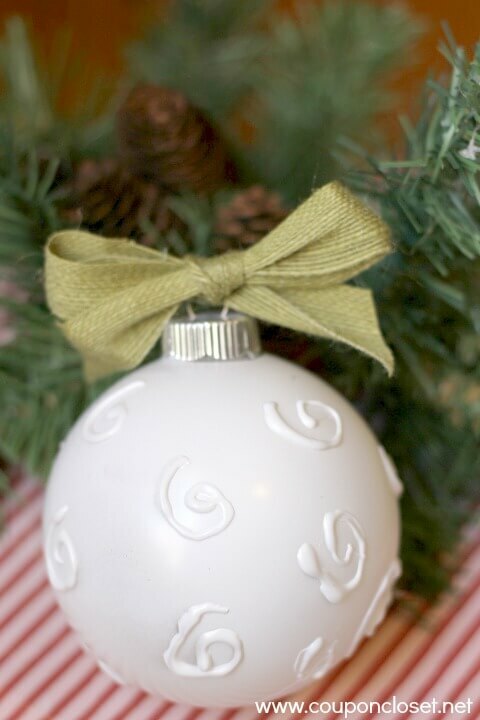 Jazz up plain old ornaments with a little glue and spray paint. You will be amazed at how fancy these turn out! 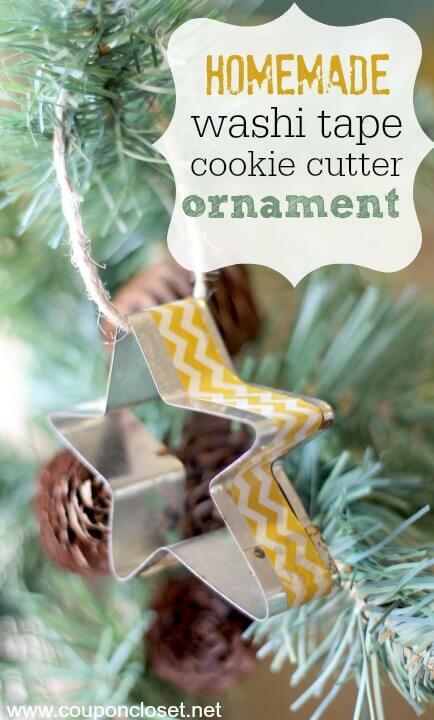 This is a great way to use old cookie cutters and turn them into sparkling new ornaments. The kids will love helping with this DIY. Not only do these look pretty but they smell amazing. Let the kids pick out cookie cutters and make their own shapes. So fun! Save up those old wine corks or order some on Amazon to make these fun ornaments. 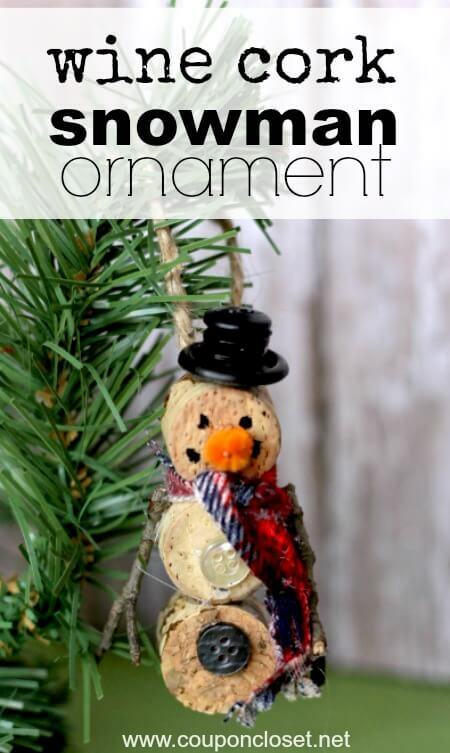 If just a few minutes, you will have cute snowman for your tree. 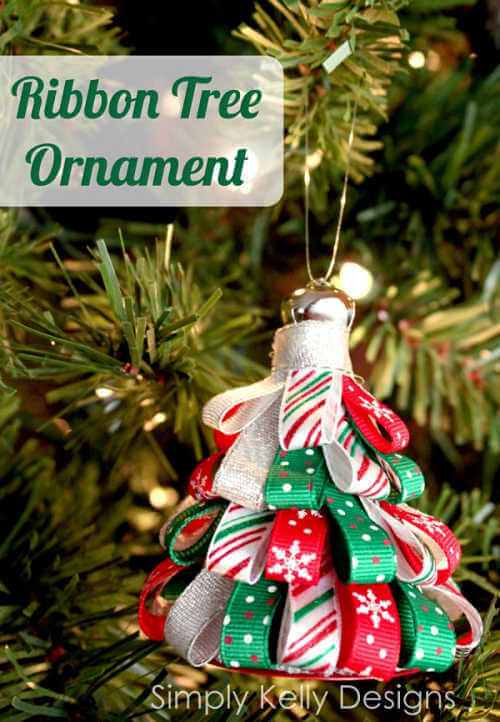 Use scraps of ribbon to make these festive Christmas Tree ornaments. 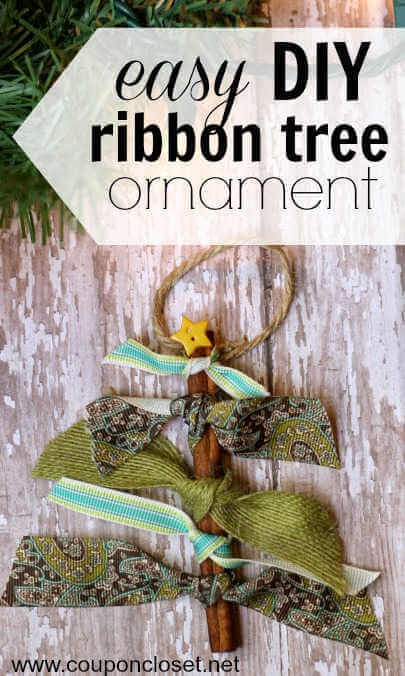 This is a great way to use up ribbon and the end result is a gorgeous ornament. Turn cookie cutters into something spectacular with washi tape. With so many designs of tape to choose from, the ideas are endless. Nothing says Christmas like glitter! 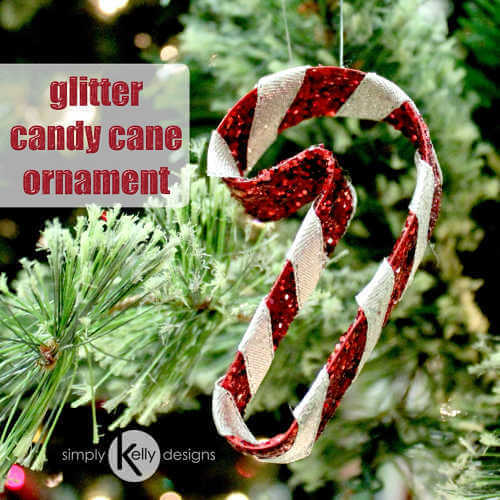 Turn ordinary candy can ornaments into sparkly little jewels! This is simpler than it sounds and you can have a lasting keepsake. Everyone will love looking at the pictures each year. 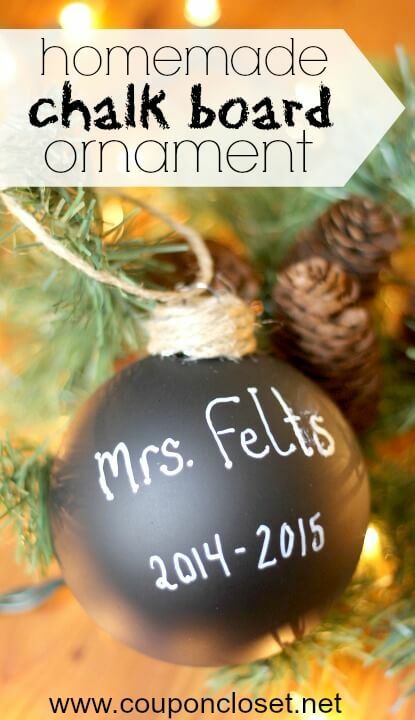 This is a great way to use art work, invitations and more for a really cool ornament idea. Grab some clear ornaments from the Dollar Store or order online. Remember special dates or little finger prints with this fun keepsake idea. We like to keep fragile ornaments like this in an ornament box for storage during the year. Do you have an old Scrabble game that is missing pieces? 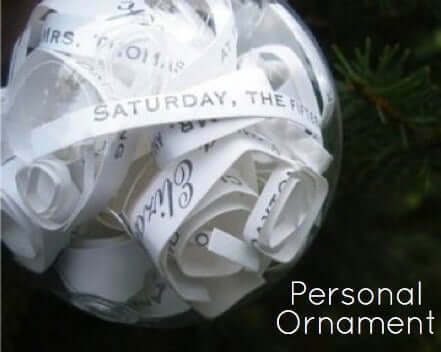 Don’t throw it away and use it instead to make Christmas ornaments. Cookie Cutters get a new look with washi tap. This is perfect for little ones when you need something simple. Don’t toss those old mason jar lid rings. 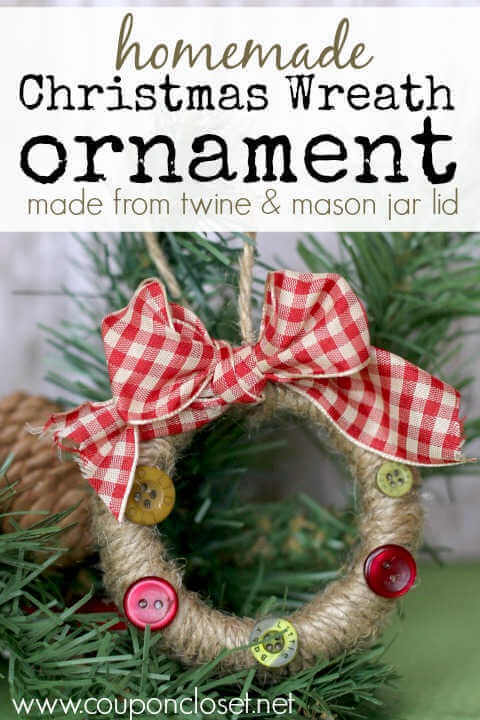 Make a Christmas wreath with them with twine and hang on the tree. 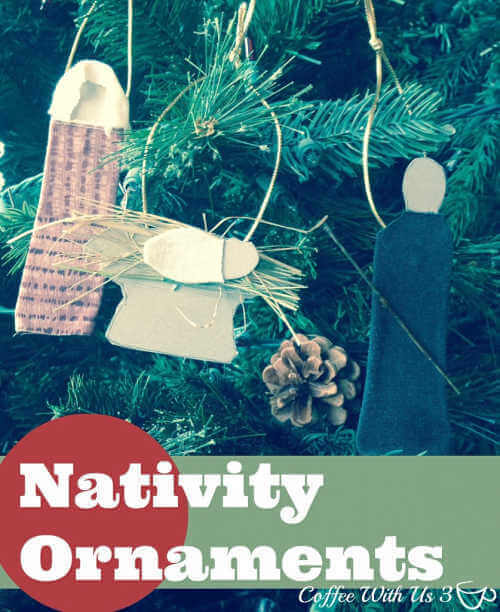 Keep the real meaning of Christmas at the center with these precious Nativity ornaments. You can likely use things you already have at home. 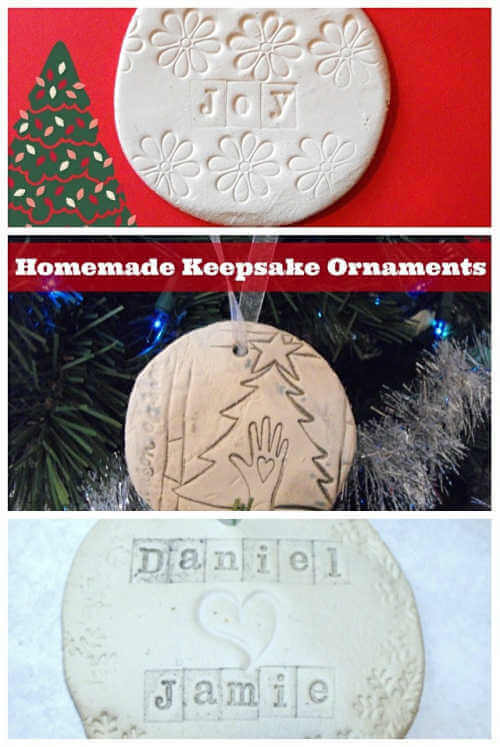 It can’t get any simpler than these 3 ingredient ornaments with fun cookie cutter designs. Plus, the cinnamon smells heavenly! Save bottle caps or order some inexpensively online to make snowman! 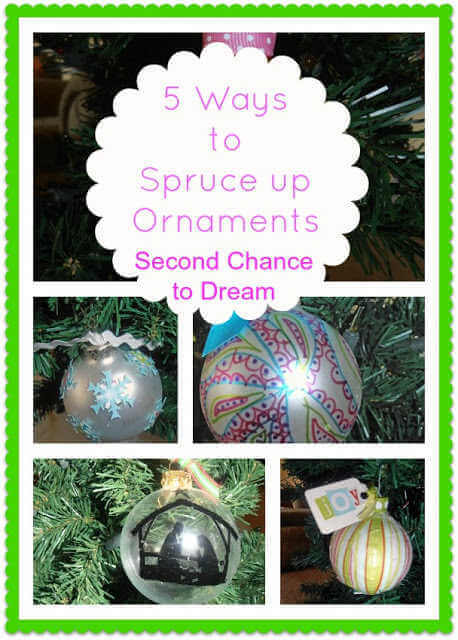 This is a great idea for ornaments using what you already have and turning into something special. 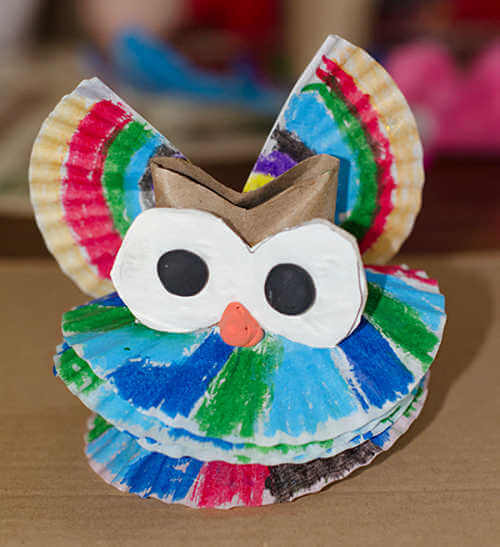 This is the perfect craft for the kids using coffee filters and other items you already have! So fun for toddlers or young children. 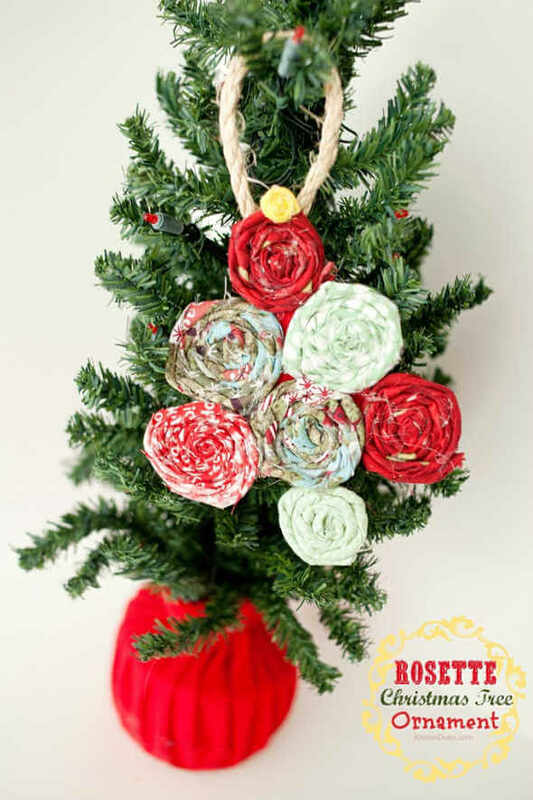 Make this darling rosette ornament with very little effort. 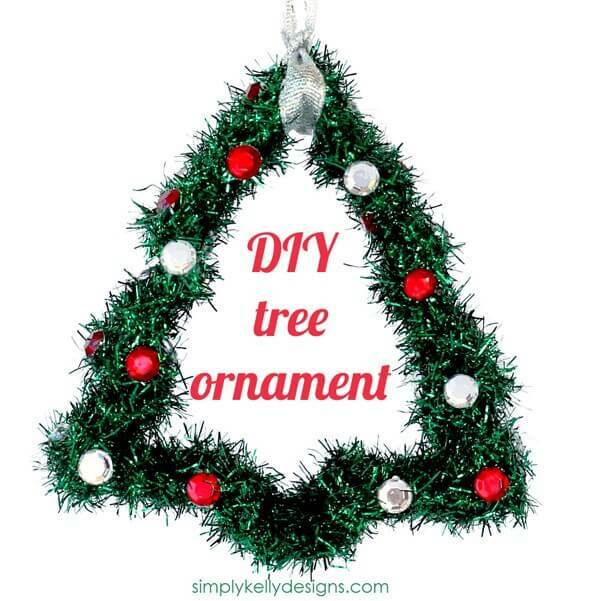 It looks so classic and perfect for a rustic but pretty touch on your tree. No need to pay Pottery Barn prices when you can make this knock off version at home. 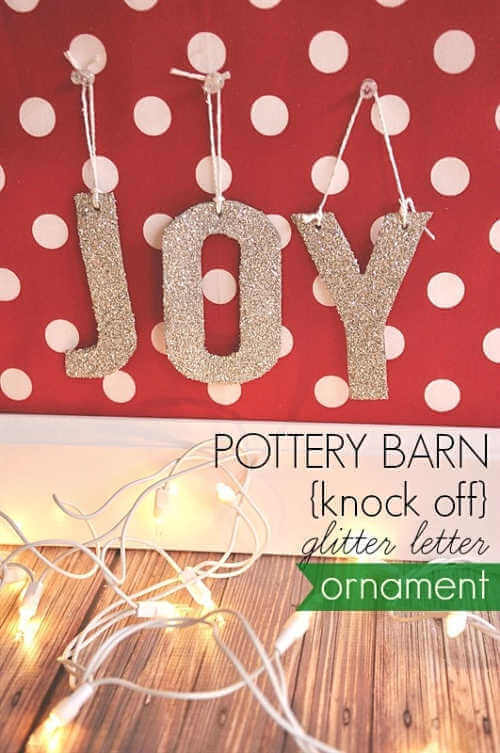 Try your hand at making this Glitter Ornament that is really oh so simple! 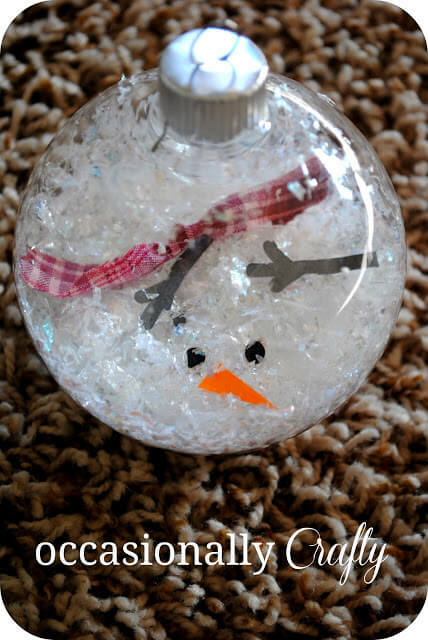 Grab some more of those clear ornaments at the Dollar Store or order online to make melted snowman. This is so clever and cute. You just need old t-shirts for this project! 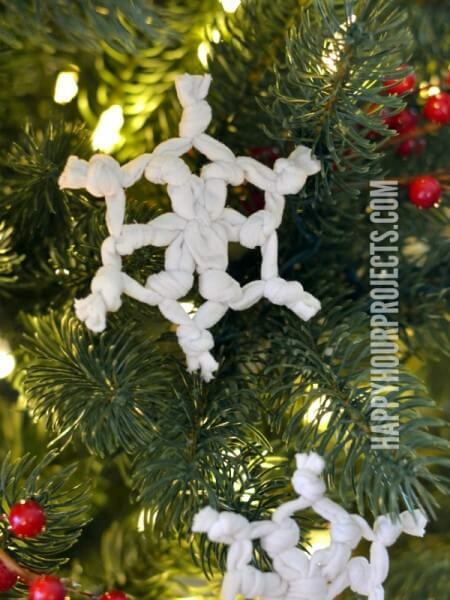 Save old shirts or outgrown clothes to make the most precious snow flakes. 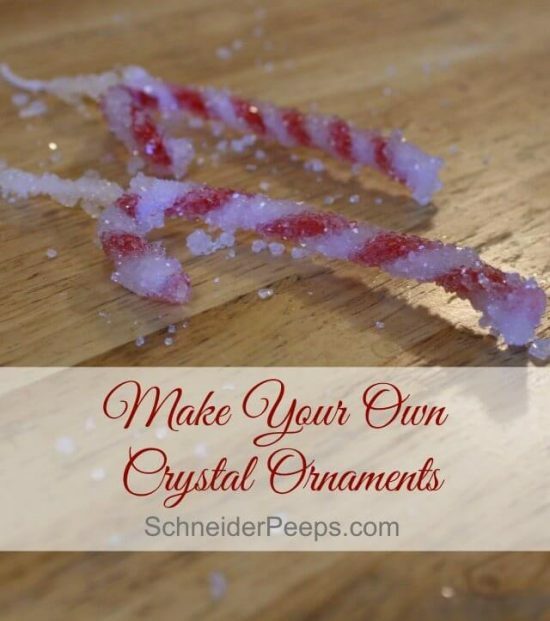 If the kids haven’t used all the borax making slime, they can make these crystal ornaments. The red and green crystals look stunning against the tree lights. 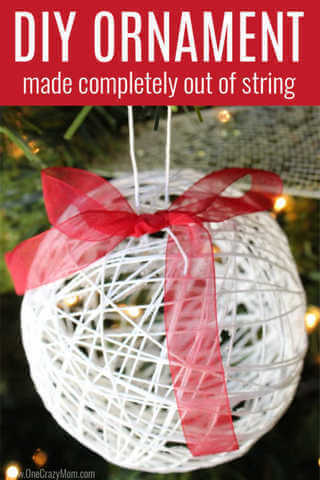 Grab some string and balloons and you are on your way to making these frugal string ornaments. The kids will love popping the balloon! 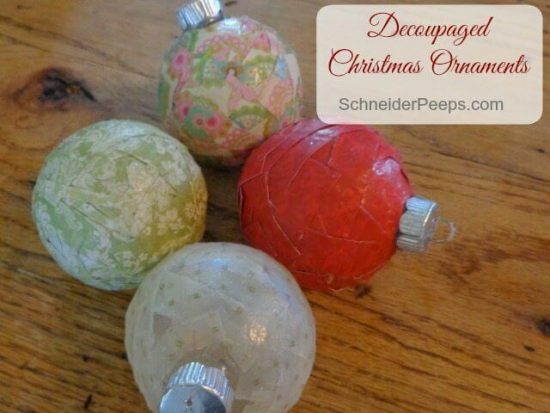 Learn how to decoupage ornaments with these fun ideas. My favorite is the one dipped in glitter. Make your own Mod Podge to save a ton of money. Love wallflowers or other fragrance plug-ins? 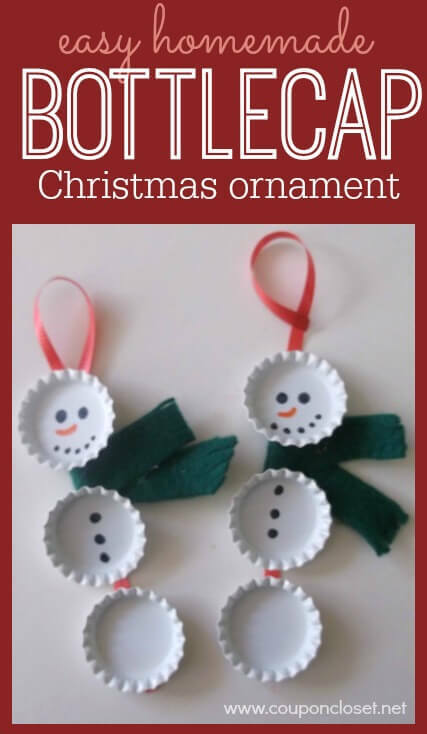 Save them to make Christmas ornaments in an array of styles. 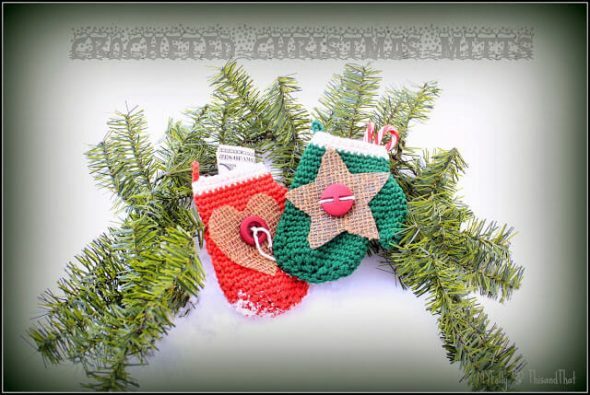 Learn how to crochet mitten ornaments with this simple DIY. Even those with little to no sewing experience can pick this tutorial up quickly. Need a gift that doubles as an ornament? 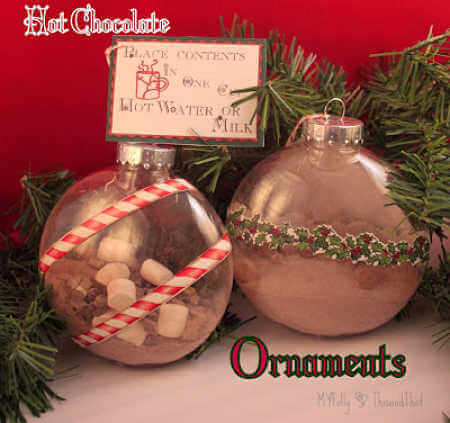 Mix up some hot cocoa and marshmallows to make this neat treat in inexpensive clear ornaments. Save old buttons and make a fun button wreath ornament. Prefer only red and green? Order on Amazon to get certain colors. This ornament is perfect for teachers, dance teachers, Grandparents or anyone you need a thoughtful but inexpensive gift idea for. Grab some chalkboard paint and get started! Make sheet music look old and vintage for these fun and classic ornaments. 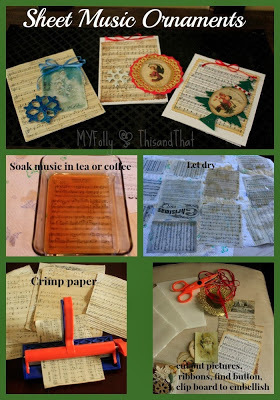 This is a great way to use up old sheet music or you can grab some here. 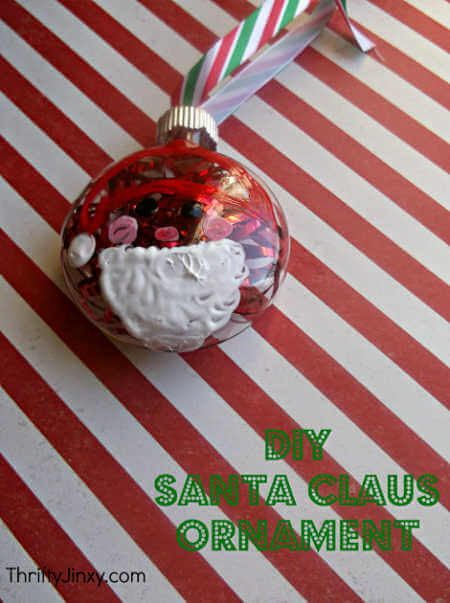 Get the kids excited about Santa with these fun and festive ornaments. 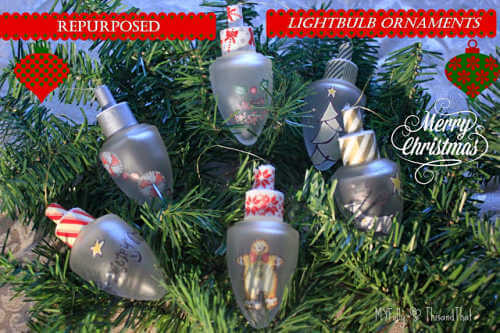 You can pick up clear ornaments so inexpensivel and they make the best crafts. 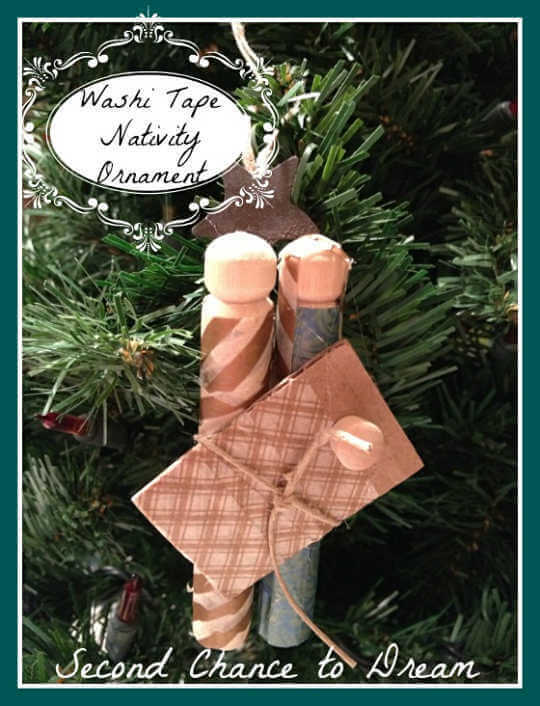 Turn a washi tape creation into a nativity ornament with just a few supplies needed. This is a great way to teach kids about the true meaning of Christmas. 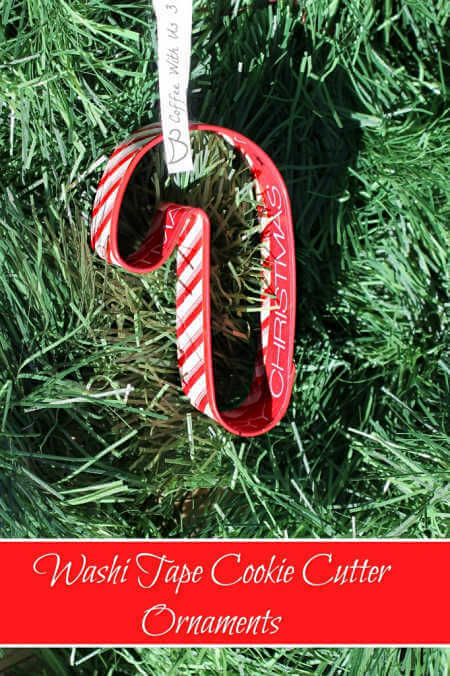 Fragrant cinnamon sticks combined with ribbon make the cutest Christmas tree ornament. Plus, it smells SO good hanging on your tree. Learn how to use items you have in your scrapbook supplies to turn plain ornaments into something magnificent. This is great to use up excess supplies. 35. Acorn Advent Calendar, Home. Made. Interest. 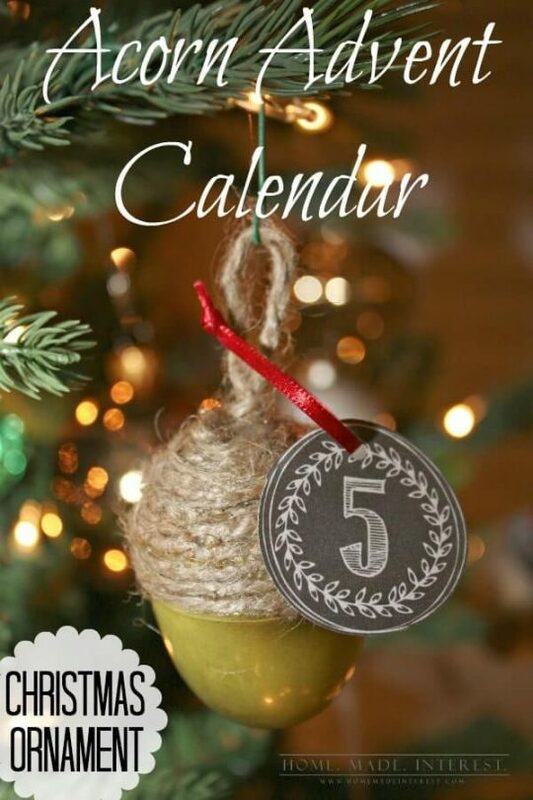 Combine acorns and an advent calendar to make this neat idea for an ornament. 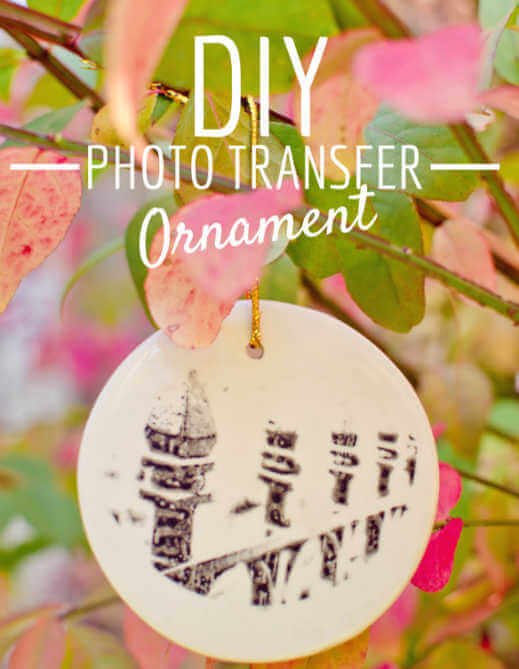 This is a fun way to think outside the box and have a pretty ornament as well. 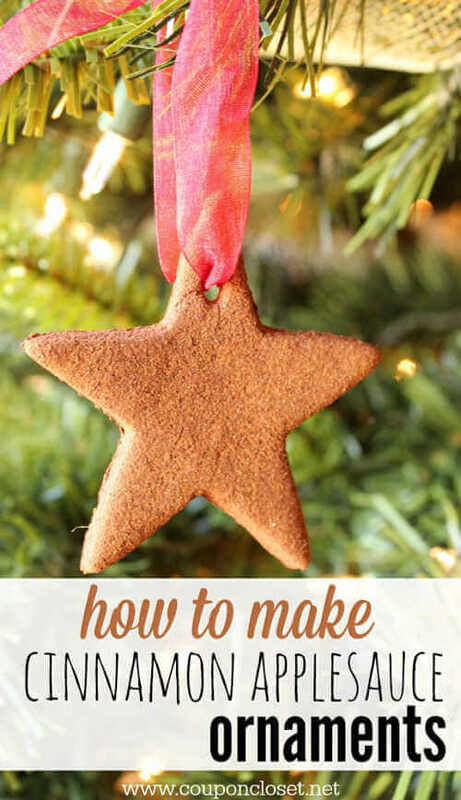 Which Easy Homemade Christmas ornaments are your favorite? I really love the ones that can be made with things I already have on hand. 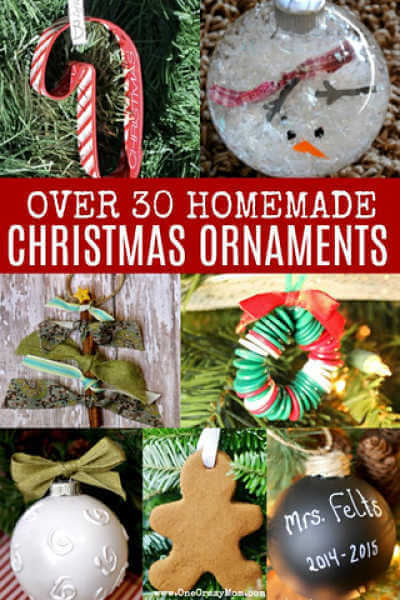 😉 All of them are super easy to make and we plan to try quite a few of these handmade Christmas ornament ideas. 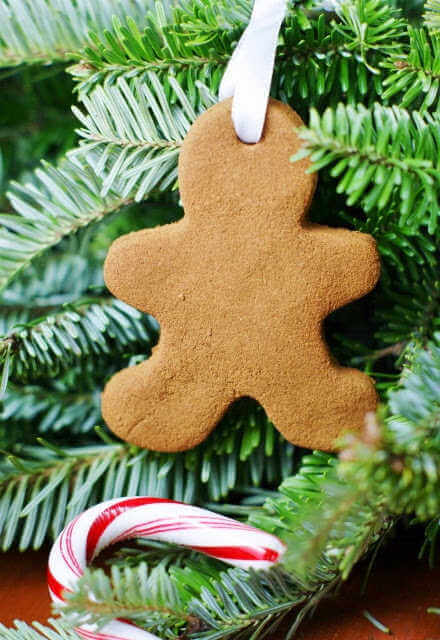 Give these DIY Christmas tree ornaments a try. Use what you have from a styrofoam ball to hot glue and acorns to have a blast with your kids! 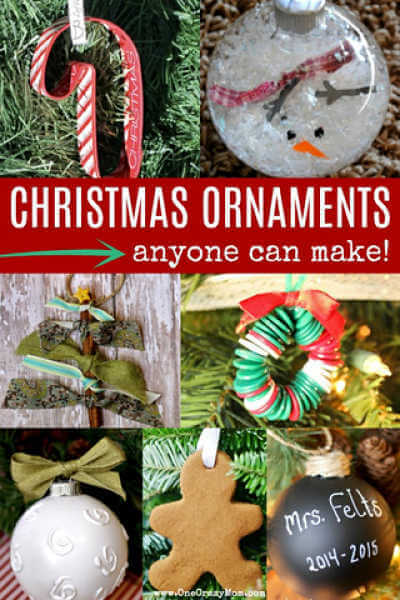 Add these Christmas ornaments to make Pinterest ideas to your holiday fun list!